The Harrier is a hound dog bred to hunt hare. 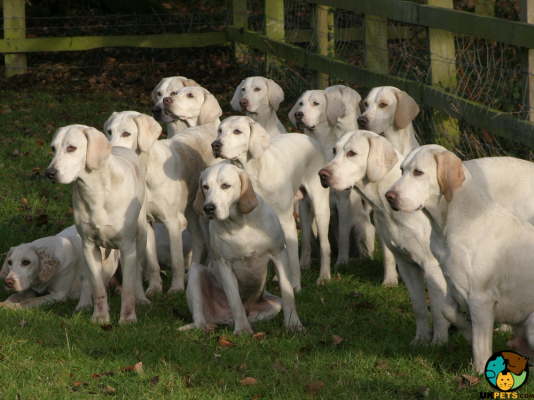 It was developed by Sir Elias de Midhop in 1260 and is said to resemble a smaller version of the English Foxhound. It weighs 45 to 60 pounds and stands 48 to 53 centimetres. 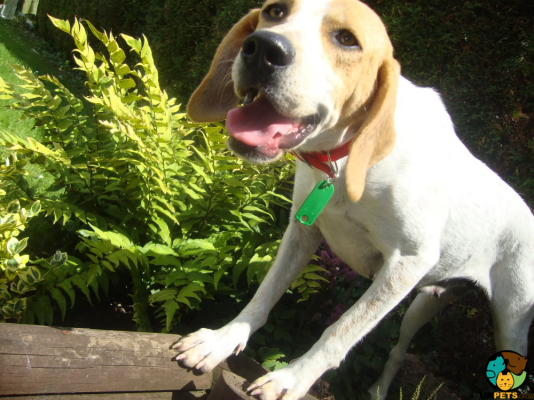 The Harrier is a hardy scenthound dog but sweet-tempered, easy-going and tolerant, especially around children. It is a wonderful family companion, a decent watchdog but a poor guard dog. Although originally accepted by The Kennel Club from 1851 to 1971, today the Harrier is no longer on the club's list of pedigree dogs. Are you looking for a Harrier dog breed? 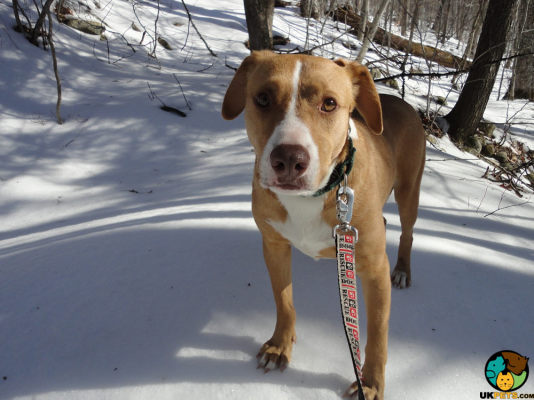 Find out more about this active working dog turned family companion. The Harrier has a less exact origin. 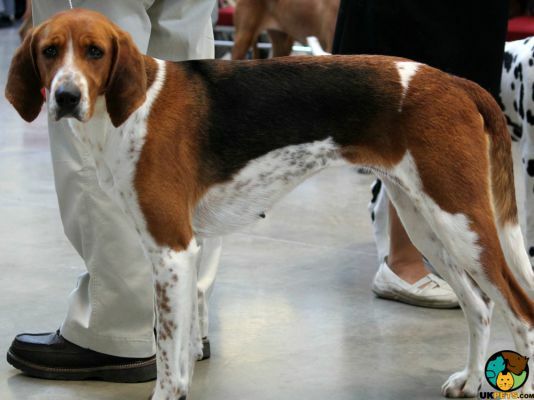 There were claims that the breed was developed by crossing the Greyhound to the now-extinct old Southern Hound. It suggests that dogs resembling the Harrier utilised to hunt hares may have been imported to England when the Normans invaded in 1066. In 1260, the first pack of Harriers was bred and established by Sir Elias de Midhope, which helped spread the breed throughout England and Wales. Other than the prior claim that the Harrier descended from the Greyhound and a now-extinct ancient hound breed, there are various reports about how it was developed. There are claims that the Harrier descended from crossing the Talbot Hounds with the Bloodhounds and Basset Hounds. 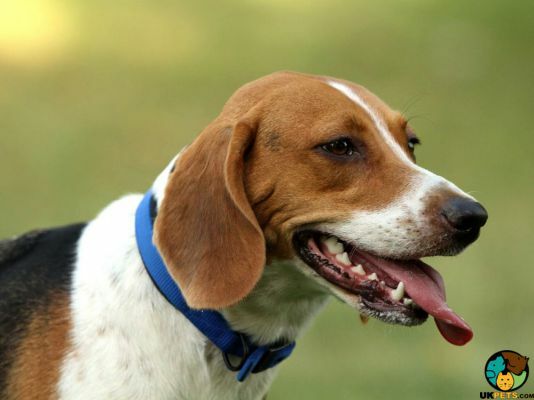 While other reports suggest that the breed was first developed from Greyhounds, Fox Terriers and Foxhounds. Another claim indicates that the Harrier descended from an English Foxhound since it resembles it a lot, albeit the Harrier is smaller. Harriers were recognised as a breed by the American Kennel Club in 1885 classified under the Hound Group. The Harrier Club of America was established in 1992. The breed was recognised by The Kennel Club from 1851 to 1971 but has been removed from the list of pedigree dogs ever since. 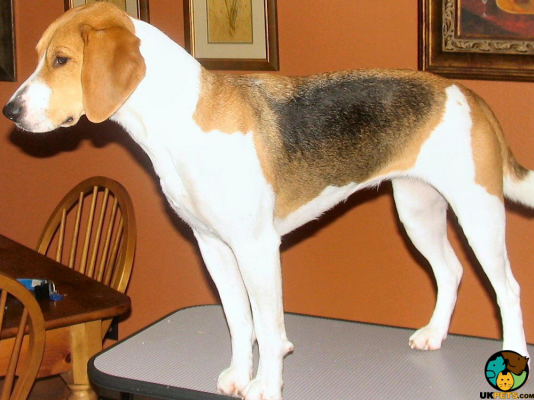 The Harrier is similar in appearance to the English Foxhound, albeit a smaller version with a weight of 45 to 60 pounds and a height of 48 to 53 centimetres. 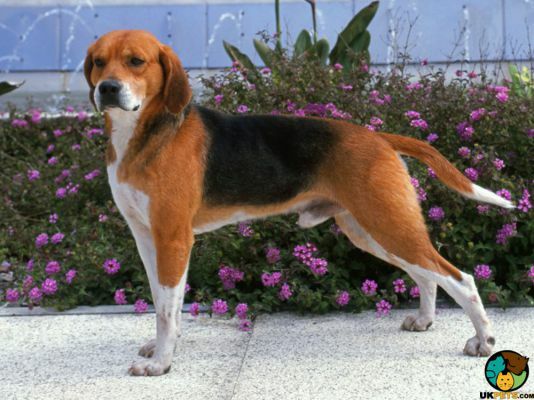 It is a compact, muscular hunting dog breed, large boned and appears longer than it is tall. Its form promotes the much-needed stamina and strength for a breed that works in the field. Harriers have heads that are well-proportioned with the rest of its body. Their hazel or brown eyes are keen and alert when they are excited and mellow they are relaxed. The nose is wide and coloured black while its muzzle is strong square-shaped. Its ears are round and shaped like a pendant. The tail is set high but not curled over the Harrier's back, while it wears cat-like feet with close toes turning inwards. The Harrier is outfitted in a short, dense coat that is rough to touch. The rough texture protects it from the harsh terrain when tracking hare or fox. Its coat is also glossy and can withstand any type of weather except extreme cold and high temperature. The most common coat colours are black, lemon and white, white and tan, and red and white. Harriers moderately shed throughout the year. With this said, it is recommended to brush its coat once or twice a week to keep it healthy. A bath can be done as needed especially when it gets dirty and smelly. Other things to do to maintain its cleanliness and overall health is to make sure grooming is done thoroughly. This means that it should include checking and cleaning the dog's ears for any signs of infection or wax build-up. It is also important to brush its teeth on a regular basis, daily if possible, to avoid gum disease, bad breath and other oral issues. Trim nails at least once a month, unless it wears down naturally. You will know when to trim nails if you hear clicking sounds on the floor. Also check the coat for any signs of lesions, ticks and fleas. Harriers are cheerful and playful dogs. They have high energy and stamina, which is why they must be allowed to spend plenty of time for outdoor activities. The Harrier loves attention and would not mind a few belly rubs from its owners. Since the Harrier is a pack dog, it does not do well when alone. So a household with other dogs is more preferable. With this said, Harriers gets on well with other dogs. However, care must be taken when it is around smaller animals. Scent hounds like the Harrier have strong prey drive and will not hesitate to give chase. But don't worry, when socialised early with other small furry creatures, the Harrier can manage to co-exist. It is very vocal when it wants to express something or when it wants to alert owners. Harriers are good watchdogs but are not the best choice as guard dogs. It is such a friendly dog that it might allow thieves to carry on emptying your house after it has done its part of sounding the alarms or when you're not at home. Harriers are also excellent with children, very playful and tolerant. However, like in any dogs, supervising playtime is a must to avoid accidents, especially it becomes boisterous. Being an active hound dog, the Harrier loves to explore and hunt, to sniff and trail potential prey. Thus, it is crucial that it is kept on a leash or at least in a safe and secure enclosed area. When it comes to training, the Harrier is an independent thinker with a bit of a stubborn streak like most hounds and can be a challenge to train. If you don't have the time or the patience to properly train an active scenthound like the Harrier, then it's best to find other suitable breeds. A typical serving for an adult Harrier is 1.5 to 2 cups of excellent quality dry dog food per day, divided into two meals. The quantity of food and how often to feed will depend on the dog's size, age, gender, activity level, health and metabolism. Carefully considering the basic nutritional needs of the Harrier is important since not all dogs are the same. Consult your veterinarian to ask for a recommendation to ensure you are providing your Harrier with a balanced diet. Like most dogs, Harriers deserve a balanced diet highly rich in protein coming from animal meat (beef, lamb, turkey and chicken). Although dogs can tolerate grains, some carbs such as corn, wheat and soy can be harmful to your dog. The Harrier, for the most part, is a healthy dog breed with a lifespan of 12 to 15 years if it is well cared for and showered with love. However, it also tends to suffer from genetic health disorders that the owner must watch out for. Some of the disorders that the Harrier can suffer from include Hip Dysplasia, Ear Infection, Allergies, Hypothyroidism, and some forms of Cancer. As previously mentioned, the Harrier has a high energy and stamina to spare, which means it will require plenty of outdoor exercises. It is also an intelligent dog breed and requires an adequate amount of mentally stimulating activities. As such, the Harrier will need at least two hours of daily exercise and will love nothing more than to engage in rigorous outdoor activities alongside is owners. Dogs, perhaps, are among the most expensive pets to own. Apart from the initial purchase of a well-bred puppy and the cost of food, there are a lot more to consider when it comes to the financial aspect. For a Harrier dog breed, let's start with how much a puppy will cost. Before that, it is worth knowing that the Harrier is a rare breed, which means you will need to be put on a waitlist and wait your turn to buy a Harrier puppy. Regardless, the said puppy will cost you around £300, which is way cheaper than most dog breeds. Pet insurance must also be factored for both your sake and your Harrier. Getting a pet insurance will cost you about £20 to £40 a month, while food costs will set you back around £30 to £40 a month. On top of all these, there is the regular veterinary check-up schedule that you, as a responsible dog owner, must religiously follow. In a year, veterinary consultations including basic procedures such as initial vaccinations will cost you at least £900. Overall, the cost to own and raise a Harrier is around £60 to £90 a month, excluding the initial purchase. 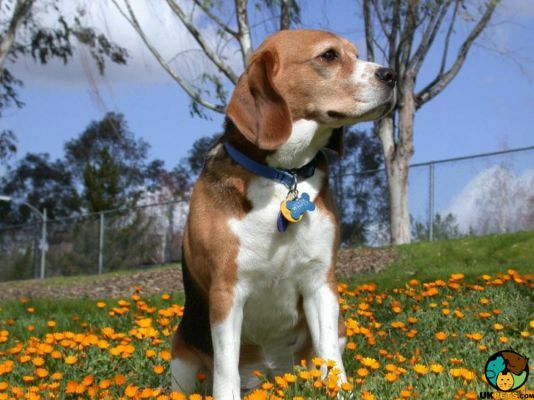 The cost will also depend on the level of insurance you will avail for your dog. Is a Harrier Right for You? The Harrier is a friendly, playful and cheerful breed. It has a high energy and stamina with high exercise needs. It is an excellent family companion, decent watchdog but poor guard dog. It is intelligent and a little stubborn, which make training challenging. The Harrier's short coat is easy to groom, regardless if it sheds throughout the year. It was recognised by the Kennel Club from 1851 to 1971 but has since been removed from the pedigree list.